Gangnam Style in Ubuntu – Mi blog lah! Gangnam Style is a song by Korean rapper PSY (pronounced as in PSYchology), and it is currently one of the most popular songs on the Internets. It’s now the No 8 most viewed video of all time on Youtube. It is definitely the most popular Korean (k-pop) song worldwide. The Gangnam Style video on Youtube was released on 15th July 2012, and currently it has been viewed over 470 million times. The song is in Korean with only a few verses in English, making it difficult to lip sync. which will download by default the FullHD version of the video clip. Other Youtube download programs are minitube (some people complain it may not work well in 12.10) and jDownloader. Then, you can load the video clip in Totem (the default video player in Ubuntu), and select at View→Subtitles→Select subtitles… the appropriate subtitle file. How do you create your own phonetic subtitles for your language? You can use one of the several subtitle editors in Ubuntu, such as GNOME Subtitles, Subtitle Editor, Subtitle Composer and Aegisub. I used Aegisub in order to create the English and Greek phonetic subtitles. In Aegisub, you load an existing .srt file, the video clip file, and then you extract the audio from the video file. Afterwards you can edit in place each subtitle line. If you manage to create phonetic subtitles for your language, feel free to send them over to add to the repository. PSY has been doing a lot of promotional appearences. 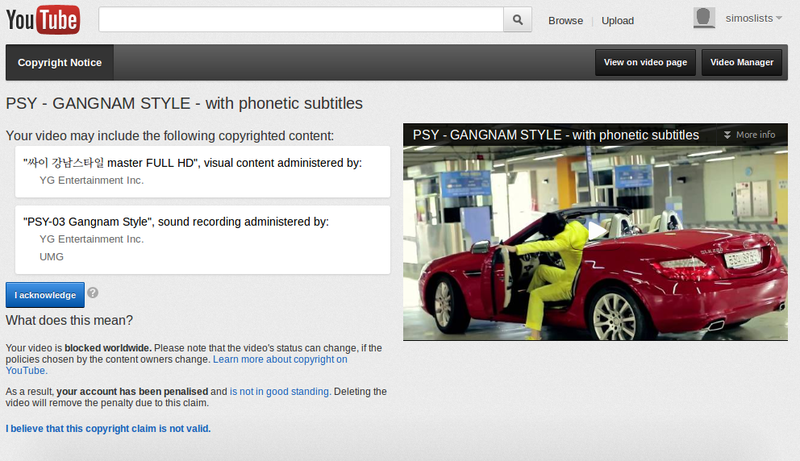 If you can work out the lip syncing, you can then try to record a video singing Gangman Style. See Nixie Pixel‘s guide to recording video in Ubuntu using your webcam. That’s no werewolf– that appears to be Hugh Jackman as the Marvel comic book character Wolverine, and it looks like PSY has similar props on his hands as Jackman does. @Thanos: I started with an .srt file with the lyrics in romanised Korean. Romanised Korean is not phonetic, so I had to listen to each line with Aegisub and transcribe it phonetically. Aegisub helped because it has a feature to play easily again and again the current subtitle line you are working on. Also, with Aegisub I fixed some of the timings of the subtitles, and also added some lines that were missing. Having done the Greek phonetic version, it was easy to convert (manually) into English phonetic. I did not use IPA as I suppose very few people can make use of it. I hope my English phonetic is easy to understand. Patches welcome. It is possible to put these on Youtube. @jaklumen: You are right, it’s «Wolverine», and the picture shows Hugh Jackman and PSY with the retracting claws prop. I updated the post. Thanks Simos for the explanation. Must have been quite a bit of work to make them then. About Youtube, I meant, that I want to see YOU in a video, gangnam style :p Are you trying to avoid it?